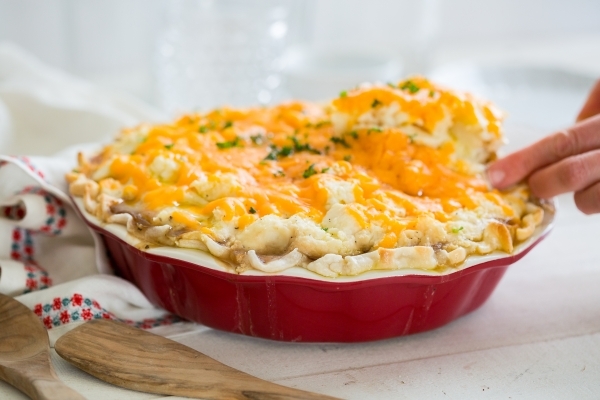 Whether you’re looking for a delicious dinner for St. Patty’s Day, or simply want a vegetarian twist on comfort food favorites, this Vegetarian Shepherd’s Pie Recipe is perfect for dinner any night! Now that’s not a bad deal to feed the whole family with this warm, comforting meal! I love serving it with a green salad on the side, but other than that, this dish is a meal unto itself. It’s especially enjoyable when the weather is chilly outside, and we’re all hankering to gather around the kitchen table and keep cozy. 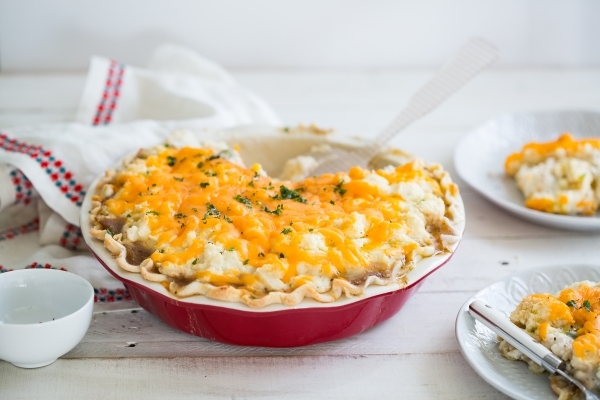 For a St. Pattie’s Day twist, stir fresh-chopped parsley and diced green onions into the mashed potatoes, and make your own colcannon-inspired topping! A totally delicious (and lucky!) twist! We’ve got even more delicious, budget-friendly recipes on our Instagram! 1. Mix together veggies, cornstarch, and soup. 2. Line a pie pan with pie crust. Pour veggie mixture inside. 3. Gently top with mashed potatoes. 4. Bake at 350 degrees for 40 minutes. Top with cheese and bake 20 minutes more. 5. Allow to cool slightly before serving.